Debt truly makes the world go ’round. It is the ultimate stepping stone toward getting an education, owning a home, driving away in a new car, and financing essential purchases that you may not be able to pay for upfront. While the word “debt” can sometimes feel extremely heavy, shrouded in stigma and misplaced shame, good debt can actually be quite healthy. Of course, when a special someone steps into the picture, any debt in your name is no longer just “yours” – it’s “ours.” For couples who aren’t careful, lack of communication about financial matters can lead to relationship ruin. 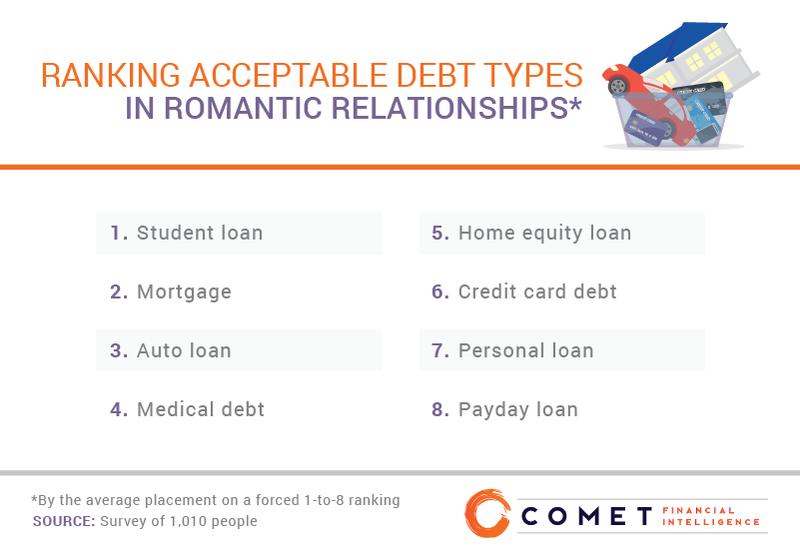 We wanted to learn more about what kinds of debt are acceptable to potential partners and which loans throw up a red flag. We also wanted to understand how much money Americans felt was acceptable to allocate to loan payments, such as student loans, each month and how those figures compared to real-life statistics. Love, money, and deal breakers – it’s all right here. Hitting the pause button on new-relationship bliss to broach the topic of personal finance can be a daunting task. 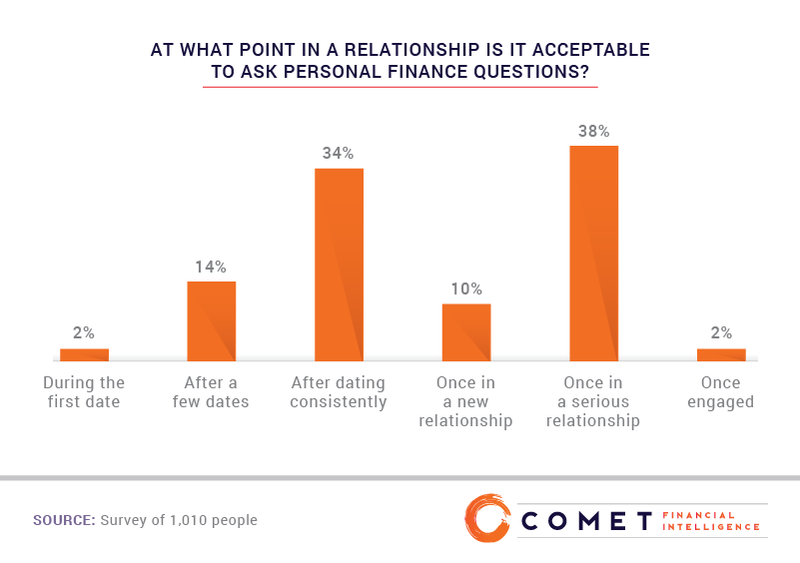 Many respondents (38%) felt it was important to start asking personal finance questions once a relationship crossed into “serious” territory, while another 34% felt consistent dating was enough to warrant a discussion. Student loan debt is one of the largest debt pools in the nation – second only to mortgages – to the tune of $1.5 trillion between over 44 million borrowers. If you walked the stage in 2016, your average personal debt is roughly $37,000. The prevalence of student loans, and the important role they play in helping millions achieve their education goals, might be why this category of debt was the most acceptable type in romantic relationships. Mortgages, which are generally understood to be good debt (meaning the loaned funds are used to buy something that should appreciate in value), were the second-most acceptable type of debt, followed by auto loans and medical debt. Given the near-universality of personal debt in the U.S., many people would struggle to find a date if having loans was seen as a deal breaker – although some red flags might indicate someone has an unhealthy relationship with their debt. 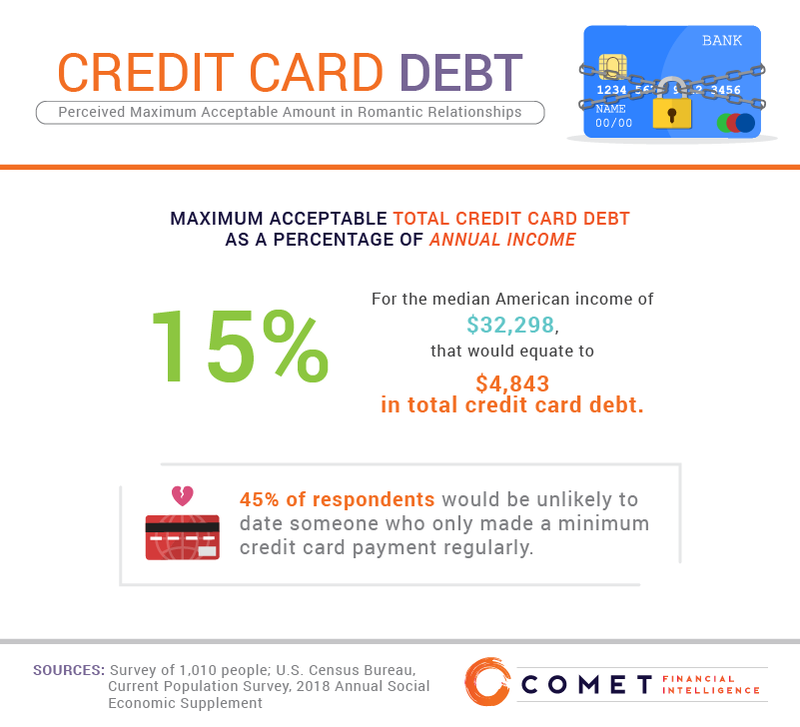 The majority of both women and men were concerned about their potential partner’s debt, at 57% and 46% respectively. 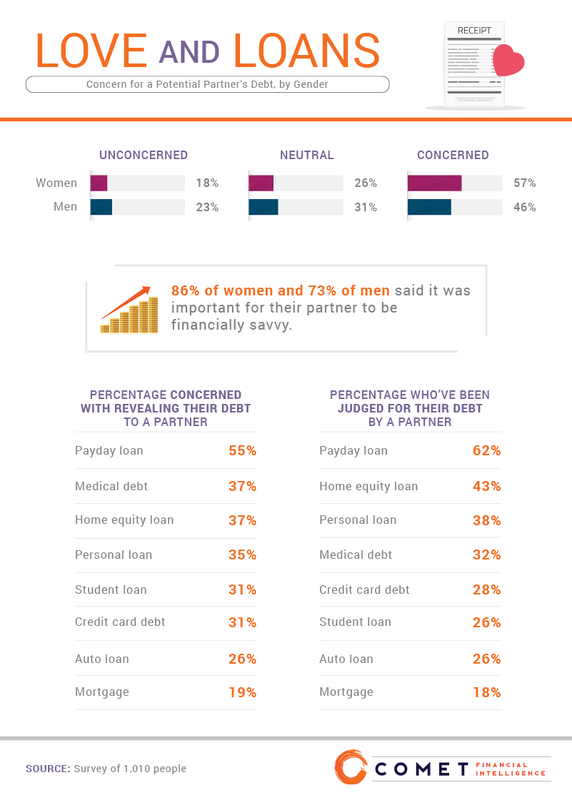 Another 26% of women and 31% of men felt indifferent, and the smallest percentage of both demographics were unconcerned about their partner’s debt level. Payday loans, in particular, were a notable concern among respondents: 55% were worried about revealing this type of debt to their significant other, an unease that may be explained by another 62% who felt they were judged by a partner for having that particular kind of debt. Each year, 2.5 million American households rely on payday loans to bridge their financial gaps, with $350 being the average payout. While the companies that dispense these loans are supposed to be used for emergencies, they are most frequently used to cover recurring expenses like bills, rent, and food. Medical debt took second place among the debt types that respondents were afraid to reveal, followed by home equity loans. However, it was the latter type of loan that garnered the most perceived judgment after payday loans, with personal loans coming in third. Our respondents felt much more comfortable with the idea of a savings-oriented partner: 69% would rather date a “saver,” while just 7% would prefer a “spender” as a partner. For many people, sticking to a structured monthly budget is a great way to monitor spending and ensure a healthy cushion for a rainy day. The 50/30/20 rule, for example, recommends spending 50% of your income on “needs” and 30% on “wants,” with 20% making its way into your savings account. 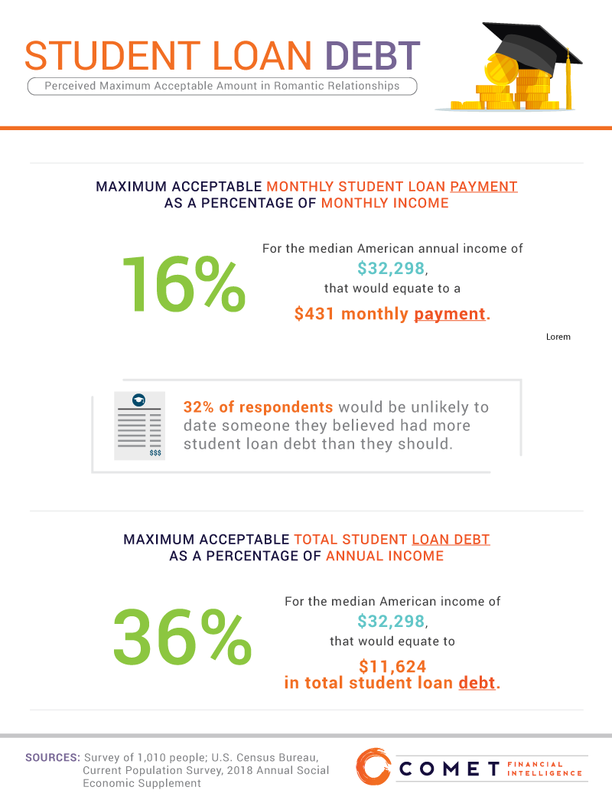 Our respondents felt that a maximum of 16% of their partner’s monthly financial pie chart was a fair amount to reserve for student loan payments, which is equivalent to $431 for an individual earning the median American salary. That figure is, in fact, quite generous: the average payment is just over $200 per month, so the grand majority of our respondents should have no issue handling debt in the context of their relationships. On the other hand, our respondents’ ideal amount for their partner’s student debt versus annual income was much lower than the real deal. They felt 36% of one’s salary was the highest amount acceptable – equivalent to $11,624 with a median U.S. income. In reality, the average student loan burden is more than $37,000, more than three times higher than our respondents’ maximum. Splurging on a purchase every now and again can be a thrill, but 70% of women and 61% of men said they would hesitate to date someone who overspent. While owing excessive amounts to your credit card company can evolve into a financially crippling situation, having a reasonable amount of debt on your credit card bill each month can be a great way to maintain good financial health. With credit cards, you can earn while you spend: Points, miles, rewards, and cash back are just some of the cool perks you can earn by being a responsible credit card owner, with the bonus of building credit and being able to make purchases online securely. The average American has a credit card balance of over $6,300, a figure nearly three per cent higher than it was in 2017. Last year, the nation’s total amount of CC debt surpassed $1 trillion. The first of those two numbers may come as a relief to our respondents, who felt someone’s credit card debt should not exceed 15% of their annual salary. Based on the median American income, that would equal $4,843 – just over $2,500 more than respondents’ maximum. Chronic overspending was a potential deal breaker for many, but unnecessary frugality was also a turnoff. Nearly half of female respondents and another 28% of men felt spending too little for no apparent reason could be a relationship deal breaker. Car enthusiasts, pay attention: If you’re planning on wooing a potential mate with your souped-up hot rod, consider pulling up in a decade-old Corolla with a paid-off credit card statement in your back pocket. 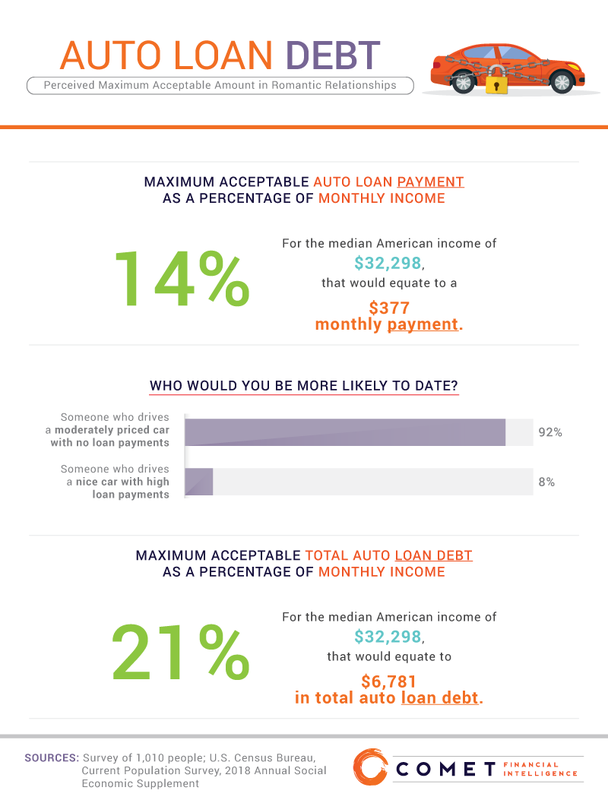 A whopping 92% of respondents said they would rather partner up with someone who had a moderately priced car with no monthly payment, compared to the 8% who favored mates with fancy cars and a high monthly price tag. Despite rising interest rates, a record-high number of Americans are taking on auto loans, with the average monthly payment on a new car hovering around $515. Used car loans come in at an average of $371. The latter figure aligns well with our respondents’ maximum acceptable monthly expenditure, which was just a hair above the actual amount, at $377 per month with a median U.S. income. 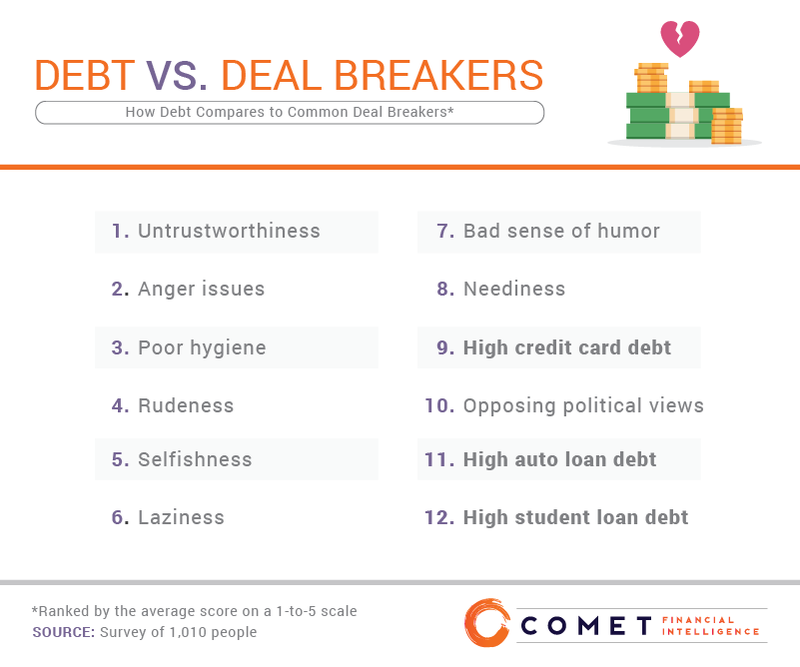 Debt may be a turnoff at certain amounts, but we wanted to see how it compared to common deal breakers. It was only with the ninth-most common deal breaker – high credit card debt – that debt made its first appearance on the list. Balanced, healthy, respectful relationships have trust at their core. If you don’t trust your partner, you might find yourself constantly looking over your shoulder, mulling over worst-case scenarios with anxious butterflies pinballing around your stomach. Of course, that’s no way to live – which is why our respondents listed untrustworthiness as the most common deal breaker in a romantic relationship. Anger issues can tear apart a relationship in similar ways, earning this trait a second-place spot on our deal breaker list. The least prominent deal breaker of all was student loan debt. It would be difficult to limit one’s dating pool based on student loans: Given the current U.S. population of approximately 325 million people, more than 1 in 10 people have them. Plus, for many people, student loans are perceived as good debt, much like a mortgage – an investment in one’s future.e. A healthy relationship requires openness between partners – and one of the most important areas of communication is personal finance. A majority of our respondents said it was fair game to start discussing dollars and cents once two people were consistently dating or in a serious relationship. For some, a shaky financial situation might be a deal breaker when looking for a partner, and a majority of respondents said they cared about their significant other’s debt. But between all major categories of debt, student loans were of the least concern. At Comet, we aim to make the process of paying off student loan debt easier than ever by refinancing your loan. Visit Cometfi.com to learn more about how you can reach your personal goals and overcome your student loans. We surveyed 1,010 respondents via Amazon’s Mechanical Turk platform. Only respondents who were single were included, and all respondents included in the study passed an attention-check question. 520 of our respondents identified as female, 484 identified as male, and six did not identify as either. Analysis between male and females did not include respondents who chose not to identify as either. To ensure statistical accuracy and to reduce the effect of outliers, responses below the fifth percentile and above the 95th percentile were excluded from calculations of acceptable debt percentages. Data from the Federal Reserve Bank of Cleveland was referenced for mean and median American income. In some cases, the percentages presented may not add up to 100%; depending on the case, this is either due to rounding or due to responses of “neither/uncertain/unknown” not being presented. Certain responses and questions have been condensed or rephrased for clarity. The data in this analysis rely on self-reporting, and the survey was self-administered by the respondents. When data are self-reported, potential issues can occur, including: selective memory, telescoping, attribution, and exaggeration. We’re not the jealous types, so if you find this information as fascinating as we do, please feel free to share it for any noncommercial purposes. All we ask in return is that you link back to this page so that your audience can view the information for themselves.